Though I come from the family of actors, acting was never in my aspirations till I completed my degree. I wanted to become a doctor first. But my average marks made sure that I don’t qualify. My EAMCET rank was also bad. I did my degree in Bio Technology. Then I wanted to get into business. I did my MBA from IIPM. I have to tell you my secret. I used to be fat since my childhood. My weight was 130 kg in 2008. My excess weight was not due to any medical reason. I was 130 because I was a huge foodie. My grandmother makes yummy prawns pulav. My mom makes sure that i eat my favorite rice+avakai+omelette+ghee in a big plate. Since I was a fat boy, I never aspired to become a hero. But, suddenly I felt like acting in movies after degree. I have taken the drastic decision to reduce weight through natural process. My weight is reduced from 130 kgs to 67 kgs in a span of two years. I used to run around KBR park a lot every day. My trainer Kuldeep helped me a lot. I changed diet from rice to boiled vegetables and grilled chicken. At one point of time, I used to consume 33 eggs a day. It was Pawan Kalyan to whom I expressed my wish to become an actor first. Pawan Kalyan asked me if I wanted to be an actor or I wanted to be a hero. I told him that I wanted to become an actor. He made me go through training at Satyanand film institute in Vizag. Then I went to Barry John Acting Studio, Mumbai. Later on I got trained by Aruna and Bikhshu. Three of my uncles (Chiranjeevi, Pawan Kalyan and Naga Babu) gave me the same advice. That is to take care of producer and deliver what director wants. I told my mother about my acting aspirations after telling my uncles as she is always worried about my security and my future. Rey was launched in 2010 and now it’s 2014. Your second movie Pilla Nuvvu Leni Jeevitham is releasing ahead of your first movie. How do you feel about it? I take it as a learning experience. I have learned how industry functions. I am very lucky to be a part of Rey film and YVS gave me a great opportunity in the form of Rey. It’s like a ‘Bommarillu Vari school of acting’ for me. I am sure that Rey will release soon and will be liked by movie lovers. 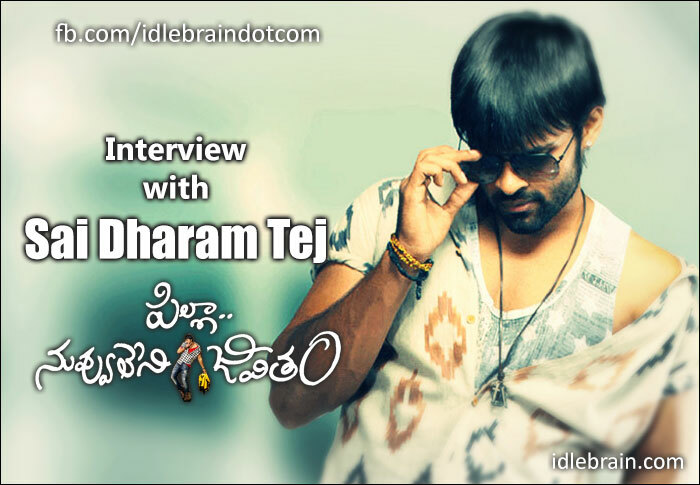 Tell us about Pilla Nuvvu Leni Jeevitham? PNLJ is about a guy falling in love and what he does for the girl. The novel thing about this film is about how story unfolds (screenplay). I play the character of Seenu. It’s a nice experience to work with Jagapathi Babu. There two huge stars from your generation of mega family in the form of Allu Arjun and Ram Charan. How do you see yourself in years to come? Both of Allu Arjun and Ram Charan have set the bar high. My aim is not to pull it down.. I feel that I am comfortable with comedy, action sequences and dances. I am very uncomfortable with intimacy scenes with heroines. I will wait for the audiences feedback with PNLJ and will improve on my shortcomings based on their feedback. Who will take decisions about your scripts? I am the sole decision maker about my film scripts. Chiranjeevi gave you a nice compliment that he sees himself in you. How do you feel about it? It’s a huge compliment. But I am aware that his compliment should be taken as an inspiration to work harder. You are lucky to be a part of Chiranjeevi’s family. It’s helps in getting recognition and great collections if the movie is good. At the same time, some people might think that there are many actors coming from Chiranjeevi family in this generation. How do you face such situations? Recently I went to a supermarket to buy a shampoo. An elderly person came to me and said ‘meeku pani paata leda. andaru cinemalloki vastunnaru’. I told him obediently that ‘naaku pani vachu. paata vachu.’ I respect views and opinions of everybody. I can only work hard and prove myself. Shooting of Rey is complete. My next film is ‘Subramanyam for Sale’ in the direction of Harish Shankar. I am listening to many scripts now. .